by Emily Jackson and John Keown. Oxford and Portland, Oregon: Hart Publishing, 2012. 200pp. Paper: $23.70. ISBN 9781849461788. 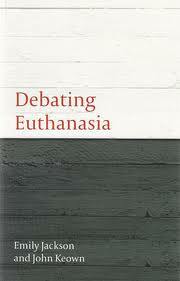 Debating Euthanasia is the third book in the series Debating Law, edited by Peter Cane. The series is designed to offer experts the opportunity to present contrasting perspectives on legal topics of interest, without an excessive use of notes. The purpose of this book is to set forth current positions on euthanasia from the point of view of Criminal Law, while remaining conscious of other legal, and even bioethical, aspects involved. Throughout the book the reader finds two different debates. First, there is a discussion about the problems raised by some cases involving end-of-life decisions, regarding which the positions of both authors are well described. The second debate involves the meaning of human life, a debate central to Keown’s arguments but less so to Jackson’s. There are therefore two different levels of debate in the discussion: legal and meta-juridical. The former is more interesting, and of generally higher quality. The book, as a whole, leads us to accept that we have a problem when we have to legally regulate the behavior of those individuals facing end-of- life decisions. And this is presented with precision and clarity. In this sense, the book contains all the relevant legal elements to allow the reader to make his own judgment, if desired, or, alternatively, it facilitates the definition of a position based on the two arguments presented. Both Jackson and Keown are recognized experts in the field, and their positions are well known: Thus the book contains (with merit) a wide variety of arguments and perspectives. And, although each author's presentation is different in his or her own way, the way in which each of them confronts identical problems is one of the greatest values of the book. In summary, over 174 pages, the reader is able to acquire a comprehensive understanding of the problems under discussion, as well as information about the most difficult legal aspects and the jurisprudential decisions involved. But the reader will not find a solution to the legal and meta-juridicial problems faced by the book's writers. Not because the authors do not propose one, but rather because euthanasia is not a problem, but a set of problems. And it is impossible, in legal terms, to find a single common treatment. Keown tries it, but not convincingly. Jackson also makes her own way, but from a legal methodology more rigorous and respectful of the law and of the legal principles characteristic of modern democracies. Euthanasia is a term that refers to an open and changing concept, an increasingly wide and complex field. It is a source of difficult problems for the [*76] legislator. Thus, the word “euthanasia” defines a conceptual space more than a case, as each author accepts from his or her respective position. Emily Jackson, starting from the meaning of the word “euthanasia” in the Oxford English Dictionary, distinguishes between mercy killing, voluntary and involuntary euthanasia, active and passive euthanasia, assisted suicide, and assisted dying. John Keown, with another methodology and purpose, also distinguishes among different circumstances, namely voluntary, active euthanasia and physician assisted suicide. And, within euthanasia, he differentiates voluntary euthanasia from non-voluntary and involuntary varieties. Jackson's argument aims to establish legal regulation which allows assisted dying in certain and specific cases. She enumerates (as does Keown, though to a different end) the arguments against this legislation, arguments both of principle and of a practical nature, identifying the obstacles which prevent such legislation due to the risks implied. For Jackson, the arguments of principle are neither religious nor ideological. She does not object to these positions, but contends that the beliefs of those who oppose a legal regulation should give deferrence to those who think differently. The ideas of some cannot restrict the freedom of others. Jackson is aware of the importance of some practical arguments about regulating assisted dying, but she does not give them such relevance as to impose legal inaction: The costs of inaction are much higher if one notices that through legal regulation it could be possible to avoid the suffering of those who simply want a peaceful death, and failing to afford them that choice is unacceptable. She believes that limited access to euthanasia is needed to face the consequences of life prolonging technologies, and that the current legal and social situation regarding euthanasia is untenable. Jackson examines a range of situations clinicians face, such as double effect, terminal sedation, "do not attempt resuscitation” orders, and treatment withdrawal, and she tries to refute objections to the various procedures focused on seeking a death without suffering. Jackson describes the various experiences in other countries with respect to euthanasia, finishing with some considerations about the consequences of delaying a legalization of assisted dying. In conclusion, Emily Jackson is not arguing for widespread euthanasia, but she favors decriminalization in certain cases, accompanied by precise and safeguarding regulations. In general, her analysis is systematic, rational and derived from well-established legal positions. The core of her argument is, undoubtedly, individual autonomy: a liberal-democratic idea perfectly consistent with constitutional democracy. John Keown has a long history associated with a particular conception of human life. This leads him to a position "Against Decriminalizing Euthanasia" and "For Improving care". This is an example where the present “debate” does not necessarily lead to opposition: logically it does not follow [*77] that Jackson is not in favor of improving care. Keown’s position is more polemical and, in a radical way, built on "we" and "they". He is also less sharp in his argumentation, perhaps as a consequence of an overload of citations and references. Keown believes that there is truth and there is error, and they cannot have the same rights. He states that, "our capacity for choice is undoubtedly important, for it is through our choices that we shape our lives and influence the lives of those around us, for good or for ill. But we should exercise that capacity responsibly by choosing for good, not ill” (p.88). Thus, autonomy is only valid for adopting good decisions: "Neither Anglo-American law nor professional medical ethics have ever held that the mere fact that I have chosen justifies what I have chosen" (p.88, emphasis in original). This is because the equality-in-dignity as a deus ex machina binds all human beings, according to Keown. On the other hand the principle of autonomy is understood according to those principles. This justifies depriving autonomy of choice to every incompetent patient. This is seemingly contradictory to his distinction between capacity and ability ( p.160). Keown reduces any decision to one between good and bad or right and wrong and, therefore, the "double effect" of certain drugs (where the “good” of relieving the pain has a forseeable consequence of the “bad” of hastening death) becomes a moral issue and not a clinical one (p.106). And when he does not find any direct legal basis for his meta-juridical proposals, he resorts to an extremely sensitive distinction in the legal world. For example, the case of suicide, whose decriminalization neither turns it lawful, nor unlawful. Of course there is not a right to commit suicide, but this does not make suicide unlawful. In other cases he undermines the right to refuse medical treatment, claiming that it is not absolute. But there are no absolute rights by definition. And sometimes he simply makes a mockery of the existing contrary arguments to his views (p.112), or dismisses the majority decisions in democratic contexts with flippancy (p.114). At other points, Keown despises key elements of legal certainty: "Absence of evidence of abuse [of criteria for euthansia] is not evidence of absence of abuse" (p.134). Perhaps, the best summary of the book is involuntarily provided by John Keown when he accuses Jackson of rejecting both the principles of human dignity and the sanctity of human life (p.172). It is precisely the different nature and scope of the concept of human dignity, which both authors share, and its consequences which feed the discussion from happily irreconcilable positions. The basis for the new regulation of such difficult concepts is born, precisely, from this kind of debate; from agreeing to disagree.